These are domiciled outside the UK, but have been given recognised status by the FCA. What is FCA recognised status? Financial Conduct Authority (FCA) recognised status means that the Funds are approved for marketing to the retail public within the UK but (and this is an important distinction between these Funds and Regulated Onshore Funds) they do not fall under the remit of the Financial Services Compensation Scheme (FSCS). Therefore, complaints and compensation arrangements lay within the jurisdiction of where the Funds are domiciled (e.g. Luxembourg, Dublin etc. ), which are different to those available for UK Authorised Funds. A large proportion of Offshore Domiciled Funds are based in either Luxembourg or Dublin. 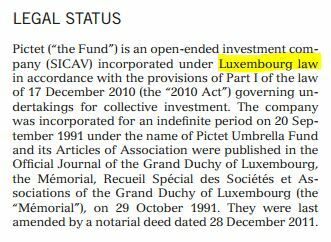 Of those domiciled in Luxembourg most are held under a SICAV (which is a French acronym for 'Société d’Investissement a Capital Variable') umbrella structure. In much the same way UK Funds can be held under an OEIC umbrella structure. By umbrella structure, we mean a collective investment scheme that exists as a single legal entity, under which many Sub-Funds are held. For example one umbrella SICAV/OEIC may hold a Sub-Fund called ‘UK Smaller Companies’ and another Sub-Fund called ‘UK Equity Income’. Each Sub-Fund has its own investment aims and is held separately from other Sub-Funds within the same umbrella. Some advantages of the umbrella Fund structure include making it cheaper for investors to move from one Sub-Fund to another and it also saves the investment manager costs relating to regulatory duplication. The FCA recognised status can be applied to either individual Funds or to the umbrella structure itself, in which case all Funds listed within that structure would have FCA recognised status. Dublin domiciled Funds are generally OEICs (Open Ended Investment Companies). What is a SICAV Fund? This is the European (offshore) version of an 'OEIC' – it is an investment company that is 'open-ended’ (i.e. its shares can be bought or sold on any dealing day). Instead of having an Authorised Corporate Director (ACD), a SICAV tends to have a board of individual directors, which may or may not appoint a management company to be responsible for managing the Fund’s day-to-day activities. Why invest in an Offshore Fund? require legal action as the only option available in the event of a dispute. The best way to check the recognised status of an Offshore domiciled Fund is to visit the Financial Services Register for collective investment schemes and input the relevant Fund details into the fields presented. The relevant information regarding where a Fund is domiciled is also available within the Product Provider’s literature, typically within the main Prospectus or the Key Investor Information Document (KIID). You can also use view a Fund prospectus via the documents section of the : explore tool. A Fund management group with non-UK (non-UCITS) Funds can submit individual Funds or an umbrella of Funds for individually recognised status. These Funds must satisfy the requirements of section 272 of the FSMA 2000. (N.B. A Fund management group may have a range of Funds domiciled in one territory within which there may be a mixture of recognised & non recognised Funds).